This photograph was taken from the deck of the black submarine, USS Becuna - you can see the USS Olympia on the left, and the restaurant ship Moshulu in the center. To get a better view of the harbor, just click directly on this photo, to enlarge it. This picture, if you scroll over it, also has text boxes indicating "Becuna" and "Olympia", when you roll over the respective ships with your browser. A visitor to this submarine is touring a remarkably preserved piece of living, 20th century naval history. The submarine served in both World War II, against Japan in the Pacific Ocean, and the early Cold War, against the former Soviet Union, in the Atlantic Ocean. 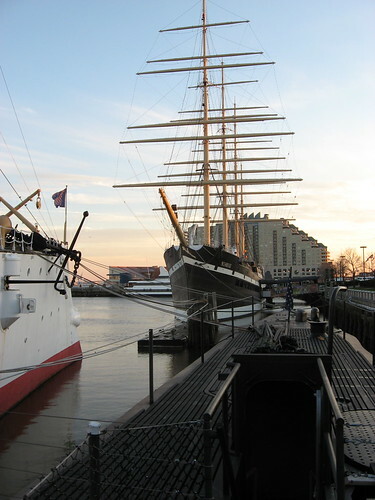 Nicknamed "Becky" by its officers and crew, it can be toured at Independence Seaport Museum in Philadelphia, at Penn's Landing. The submarine is of far more recent vintage than USS Olympia, the other ship you can tour at the Museum. Olympia was launched in the 19th century, and fired the opening shots of the Spanish-American War in 1898. In contrast, "Becky" was launched more than half a century later, in 1944, in the midst of World War II. The submarine completed five patrols in the Pacific Ocean, against the Japanese during the conflict. Its service did not end, though, with the Japanese surrender in 1945. Six years later, during the Cold War with the former Soviet Union, Becuna was modernized and assigned to Atlantic Ocean patrols, trailing Soviet submarines. Finally, in 1969 - after a quarter-century of service in the Navy - Becuna was decommissioned. Fortunately, it was preserved, for the benefit of future generations. You can learn more about Becuna, at the official Independence Seaport Museum web site's page on Becuna. If you'd like to leave USS Becuna and enter USS Olympia, please click here. If you'd like to return to Independence Seaport Museum, please click here.